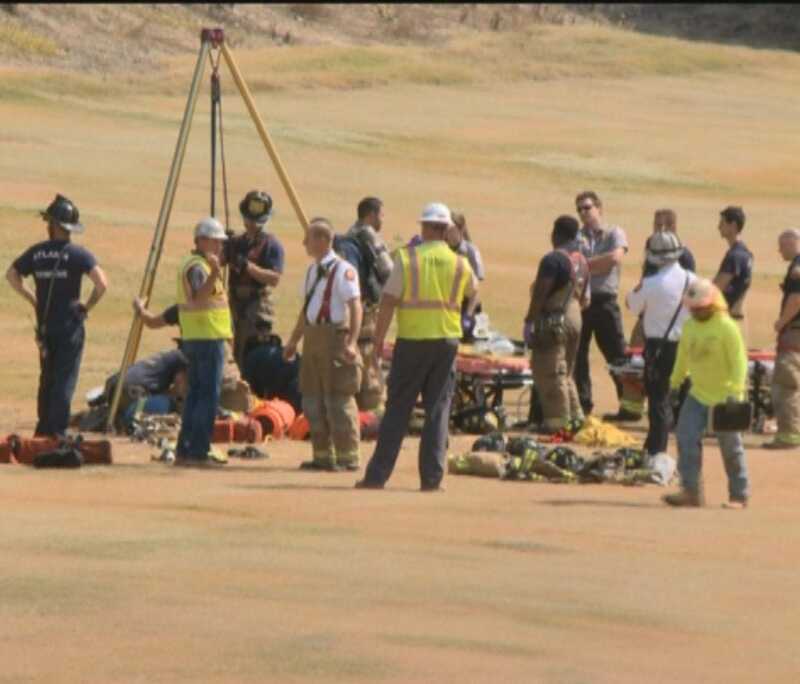 ATLANTA -- Rescue crews have pulled two construction workers from a hole on Georgia Tech's golf course. Officials with the department have confirmed that the two fell down the 14 foot hole. It happened at 450 16th Street NW near Georgia Tech Golf Course. Both were conscious and breathing after being pulled from the hole. They were transported to the hospital. Their conditions are not yet known. 11Alive is attempting to gather more information. ATLANTA -- An Atlanta Police officer was arrested and suspended without pay for helping a wanted man escape a fugitive squad. Officer Tommy Williams, 24, was taken into custody May 21 and charged with obstruction, violation of oath and hindering the apprehension of a criminal. He was released from jail on bond the following day; his next court appearance is scheduled for June 5 at 9:30 a.m. According to a police report, Williams was part of a fugitive unit dispatched to a house in the 500 block of James P. Brawley Drive on May 14. The officers were at the house to arrest Jabri Mathis on murder charges. ATLANTA -- At least two people were shot at a home in northwest Atlanta late Saturday. Atlanta Police believe it started as a house party at 428 Hamilton E. Holmes Drive. A man and a woman were transported to Grady Memorial Hospital with non-life-threatening gunshot wounds. Authorities believe there may have been a third victim. ATLANTA -- School may be out, but the fight to keep an ousted Atlanta Public School principal on the job has shifted into high gear. Frederick Douglass High School has had seven years principals in 9 years. Dr. Tony Burks, who started last summer, received notice in early May that he would not be returning to the school. ATLANTA (WXIA) – Atlanta police have arrested and charged the man they believe shot and killed Dantavious Chatman on April 21, while Chatman and his three year old daughter were waiting at a bus stop. The suspect is Deon Clinton Davis, 23. Police did not have to search for Davis when they were ready to charge him – he was already an inmate at the Fulton County jail, arrested earlier this month in a separate case of armed robbery and aggravated assault. Chatman's mother, Veronica Tuggle, told 11Alive News she is grateful a suspect has been charged, and spoke of how hard this has been on the family, especially Chatman's daughter, DeKayla. ATLANTA -- A driver died after crashing a vehicle in Fulton County Monday morning. The accident happened at around 4:15 a.m. in the 4000 block of Wendell Drive, just south of Charlie Brown Field. Fulton County Police Det. Melissa Parker said the 26-year-old driver was the only person inside the car, a Pontiac Grand Prix. The driver lost control of the vehicle near Wendell Court and hit a tree. Responding crews found the driver entrapped and unresponsive in the car, which had caught fire. The victim was freed and taken to Grady Memorial Hospital. Parker said the driver was later pronounced dead at Grady. The person's identity has not been released. The crash also caused a water pipe or water main to break, according to Parker. ATLANTA (WXIA) -- Atlanta Police have located a missing 16-year-old girl they said disappeared Wednesday afternoon. Police said Zania Gebre-Hiwet had called for a ride when school was dismissed at Washington High School at 45 Whitehouse Drive, just off of Martin Luther King Drive on the city's west side. According to Sgt. A.B. Jackson, when someone arrived at the school to pick her up, she was not able to be located. 11Alive learned at about 9:40 p.m. that she had been found and is well.